Too often, I see law firms pulling a Ricky Gervais with their content. While they might have multiple audiences with overlapping but separate interests, they try to cater to both with identical content. What you get is a content program with a lot of effort invested but diminished ROI. In the end, the old adage is true: You can’t be everything to everyone. Because it is the beginning of the year, this is a great time to audit your law firm’s content marketing program. To help with what should be an annual ritual, I offer you these five signs that your law firm doesn’t know its audience. Oh, and fear not if one or more of these resonate with you. First, a content strategy is forever in a state of evolution. Second, each is easily fixable with a little effort and fine-tuning. 1. You’ve never conducted a target market analysis: Before you can target your market, you have to know your market. That’s why the most critical piece of market intelligence for your content program is the target audience profile. This is a document that identifies and deconstructs your market segments, from decision-makers to referral sources to influencers. These can be broken down along any number of lines, from general demographic information – such as age, income and title – to the unique factors that influence each audience segment’s purchasing decisions. 2. You never change your voice: A verbal brand is a key component to an overall brand strategy for any law firm. (FYI, a “verbal brand” is a combination of the diction, sentence syntax and other linguistic elements a brand uses to give itself an original identity.) However, even a verbal brand can be tweaked depending on the audience. Consider how you talk to your spouse versus your boss. Or how you talk to a child versus an adult. These same principles of interpersonal communication apply to organizations. While you don’t want to run afoul of your firm’s verbal brand elements, you should allow for flexibility so your lawyers sound like lawyers when writing for lawyers and like helpful advisors when writing for non-lawyers. 3. You have one blog representing your entire firm: I fully encourage law firms to start a blog. It’s a great way to develop credibility, reach an audience consistently, prove value and gain prominence among search engines. However, I’ve seen some law firms try to create one blog for the entirety of the firm, despite the firm handling any number of legal issues, from real estate transactions to discrimination lawsuits. The problem with this strategy is that you end up talking about everything to everyone, which means that nobody wants to listen to you. Content marketing is meant to be tailored to a niche audience. Otherwise, how can you possibly expect to create affinity with your brand, let alone break through the content deluge that exists across the Internet? My recommendation: Identify the practice or industry group that A) has a clearly defined audience and B) has attorneys who are willing to invest the effort required to produce relevant content for that audience on an ongoing basis. 4. You talk about yourself all the time: You know how you get bored when you meet someone at a party and their favorite subject is themselves? That’s what you look like when your law firm prioritizes talking about a new ranking or a new hire over the issues that matter most to your clients and prospects. While it’s important to promote your law firm’s accolades and developments, the priority is always your audience’s needs, and the vast majority of your audience need information to help them overcome a serious problem or challenge. Make sure that your prime real estate – like the top of your homepage – is devoted to your audience’s needs. Firm news can still be placed prominently; it just shouldn’t overshadow your thought leadership. 5. You don’t interact on social media: A few years ago, I was just happy to see a law firm have a presence on social media. That was a major triumph. But the bar has been raised since then, and frankly, if you do plan to get any real ROI out of social media, just being there and posting is not enough. The key to success with social media is interaction and, to interact effectively, you need to know your audience. What’s an interaction? I’m talking about retweets, comments and responding to comments. It also includes creating posts that foster engagement, such as prompts and polls. Your content marketing program must continually evolve. 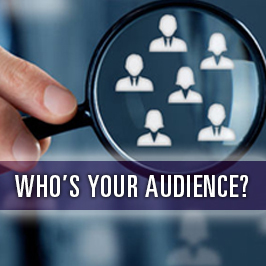 If you haven’t taken the steps to create audience profiles for your various constituents, make that a goal for 2016. And if you need any help doing it, contact Terry M. Isner at tisner@jaffepr.com.